WFS Earns ‘Cargo Handler Of The Year’ Award in Miami for Third Year In-A-Row..
…For Its Commitment to Security, Technology and Innovation. 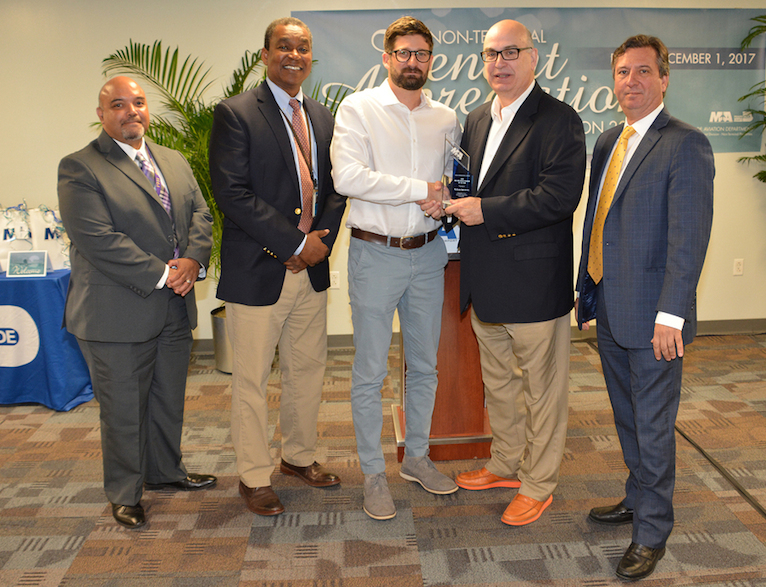 Worldwide Flight Services’ (WFS) commitment to safety, security, innovation, service and the local community has earned it Miami International Airport’s (MIA) ‘Cargo Handler of the Year’ award for the third consecutive year. The annual award winner is chosen on the basis of its use of technology and innovation, its economic impact and job growth, awards and industry certifications, and community involvement. Company nominations are judged by senior executives from Miami International Airport, the Chamber of Commerce, Beacon Council and professionals from the aviation industry. In its submission, WFS – one of the largest cargo handlers at MIA – highlighted new developments in 2017 to its ePIC operating system, which was developed in-house to innovate cargo handling processes, provide seamless interfaces with airline IT systems, and embrace a paperless working environment. This year has seen the launch of a new eScreening module to fully integrate the cargo screening process into ePic and to deliver a paperless process that meets the U.S. Transportation Security Administration’s (TSA) cargo security requirements. In support of WFS’ global commitment to the highest standards of safety and security, it has also invested in upgraded high definition CCTV technology for its facilities at MIA, and launched a new Security Observation Center (SOC), a remote 24/7 CCTV monitoring team to control and observe all WFS operations in real-time. 2017 has also seen over $2 million invested in WFS’ 30,000 sq ft Perishables Handling Center infrastructure and a newly-built temperature-controlled pharma facility. Earlier this year, WFS achieved IATA CEIV Pharma certification in Miami, making it one of the first CEIV cargo handling operations in North America, and renewed its IATA Safety Audit for Ground Operations (ISAGO) accreditation at the airport. In addition, WFS has developed an in-house computer-based Learning Management System to provide an interactive training experience for its employees, which enables real-time tracking of training programs and compliance as well as the flexibility to complete training on desktop PCs, mobile phones or tablets. In recent months WFS has also supported the humanitarian relief effort in the region following hurricanes Harvey, Irma and Maria, handling C-130, DC-9, 767 and 747 aid charters. WFS operates 11 cargo handling facilities at Miami International Airport, serving over 30 airline customers. 2017 has seen a 10% increase in its workforce at the airport as its annual volumes have soared close to 600 million kilos. From left to right: Jason Wilson, Divisional Director Real Estate Management & Development for MIA, Greg Owens, Assistant Director Business Retention & Development for MIA, Shawnpaul Booth, Vice President of WFS, MIA Airport Director Emilio Gonzalez Airport Director, and Alex De Gunten of Heico, one of the Judges on the selection panel.